The Minutemen give illegal aliens humanitarian aid (food and water) all the time but all you here from the IA apologists is that they're a bunch of armed racists out to shoot Mexicans. I'm all for giving them humanitarian aid when needed, as long as it's followed by a return trip to their HOMELAND. I've defended the Minutemen numerous times. I refuse to believe most of them are anything other than a sort of "Neighborhood Watch"....and that if ONE of them so much as hurt a "hair on an illegal's head" it would be in the headlines for a week...believe me, THAT would be a story. Those who want to 'gripe' about the Minutemen may do so, of course...call them "nosy"....or "pesty"....or call them "embarrassing", if you yourself are supposed to be apprehending the trespassers the Minutemen are only observing...but don't call them 'mean-spirited racists'. THe job is MUCH too 'hands off' to satisfy any racist 'worthy of the name'....and besides, a number of Minutemen share the 'race' of those they observe. Even the President of the US couldn't muster up much more of a condemnation of them than a mumbled "I don't like vigilantes"...well, no KIDDING, Mr. President....especially when those 'vigilantes' are documenting the problem YOU refuse to discuss. But even Bush couldn't come up with anything more 'colorful'...probably because there IS nothing more to say. You sure know a lot about what goes on out there - a little too much. How do you know they are not rapists and criminals? How do you think the rapists and the criminals get here? Sure, it's just water, but is water keeping them alive to get HERE, they are not supposed to be HERE. If it gets so hot and unbearable they need to turn around and go home. Drink all the water they want and GO HOME. 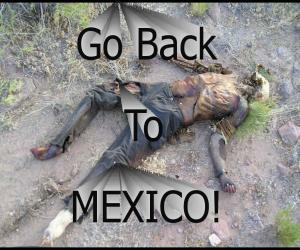 Cowboys beat up illegal aliens? Have you seen that? Only cowboys do that? I think mexicans beat up on mexicans more than cowboys do. From what I have seen they treat each other worse than any cowboy. I don't think you can be raised in this beautiful country and not have decency and not be appreciative of what we have. We all know why they want to come here, everyone does. BUT they are breaking the law. They should take their own water if they want to break the law and not expect the kind hearted people that can be walked all over called Americans to do it for them. They do have water in mexico, right? I don't think being ignorant is a good excuse - and they probably wouldn't like you calling them that. Youre right....how do we know which ones are killers and rapists and which ones arent? So if we let thousands of people die to kill one or two killers, its worth it right? And I said they were ignorant to whats on the other side of the border. Thats not really derogatory at all. They were coming and dying before the water stations we put out. They come all times of the year not just July. You deal with your concience the way you want and I will do the same. Good grief. Are you so foolish to think we should help the ILLEGALS come? Let the coyotes they pay to get them here supply the neccesities for travel. and don't make the mistake of thinking all coyotes are Mexican, there are Americans too. So their job is to get the group over the border and they are dumped in the desert, if some die on the trip, so be it...they already have received their money if they are dead or alive. AMC760 is correct that many hate illegals enough to wish them dead. When a person has the concept that another human being's life can just be discarded, it does not speak well of that person or those that share that belief.